‘Dal’ is an odd word. It doesn’t quite have an English translation¹, so I left the title as it is. It isn’t a single plant. It isn’t one recipe. If I were to attempt a definition, it would be, dried seeds of certain plants that are cooked down to mush and spiced. Dal is also a mindset. There are hundreds of recipes for dal all over India, but they all have a few things in common — the feeling of simplicity and comfort. Skip to information about legumes. 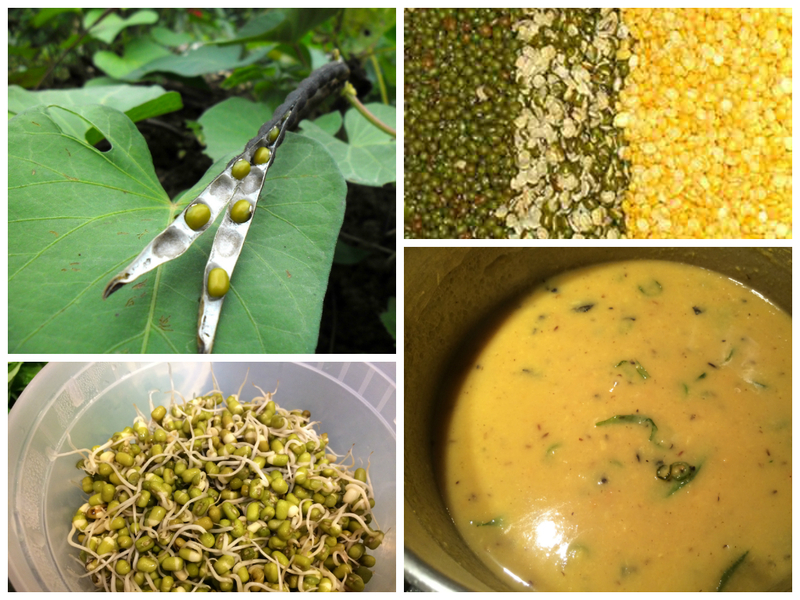 Biologically, all dals are legumes. These plants perform the useful function of capturing nitrogen right out of the air and into the soil, making it richer. This capturing of nitrogen means that legumes are an excellent source of protein. Perhaps this is why dals are eaten as a side at almost every meal in largely vegetarian India. Soybean — another legume — is is what tofu is made out of; invaluable as a source of protein for the Buddhist parts of Asia. If you are out and about hiking in nature, here is a quick way to know if a plant is a legume: the leaves may be compound and grow in rows of little leaflets. And, the fruit will be a long pod that looks like a green bean. Now humans have eaten legumes for thousands of years; one of the things that fascinates me is the number of stages that this plant family offers for our consumption. Some legumes are eaten in their long pod stage while the seeds inside are still vanishingly small. Green beans, guar beans, snap peas come to mind. Some legumes are eaten when the seed inside has grown to a chunky size but is still fresh and green and easy to cook or eat raw. The pods are usually discarded but sometimes not. Shelled peas is an example of that, edamame is another. Some legumes are eaten when the seed inside the pod has dried up, and at this point needs long cooking. The pod is discarded. Many dishes use the entire whole seed with its husk still on. In this stage, the seeds are known as beans. Or one might split the seed into two but leave the husk on. Or, one can deshusk the seed halves, until one is left with the domes that cook easily into a creamy texture. Another stage at which to enjoy your legume seed is to sprout them. This is easily done, and requires no special equipment. Soak the whole beans overnight. Then, spread them out among layers of damp paper towels or cheesecloth; cover with more layers, and cover the whole thing to keep it dark. In a day, the seeds should start to sprout, and in a couple more, they will grow longer. Sprouted seeds cook easily. The dried seeds can also be used as a flour, ground up. Besan or chickpea flour is an example of that, used to batter foods before deep-frying, or thicken soups, or make crepes. Neither the fresh pods, seeds, or the sprouts fall under the ‘dal’ category. It is only the dried, split seeds (4 and 5 above) that are called dals. They all need long cooking with water in order to be digestible; some need long soaking before the cooking as well. But when one simmers them for some time in water, they turn mushy and creamy, and present their incredible and subtle flavors with the addition of salt and a few spices in fat. Dals don’t need dressing up beyond the basics. For most families, a simple dal along with either rice or roti makes a frugal and healthful meal. A simple dal with rice is often a baby’s first grown-up food. The mung bean is native to the wet teak forests of western India but now grows all over other parts of India, Pakistan, South-East Asia and other places. The ways in which other cultures have chosen to use mung bean is a fascinating topic: mooncakes in China; sauteed with shrimp in the Phillippines; dessert snack in Indonesia; sweet beverage in China; ice cream in Hong Kong. In India though, mostly, it is used as a dal: the whole bean is often used, sprouted or not; the split bean is used to make creamy dals, with the skin on or without. If it were my job to ‘sell’ mung bean as a dal (even though it certainly doesn’t need mine or anyone else’s help), I would point to a few things: it doesn’t need soaking, it cooks easily especially in its split, dehusked form; it causes much less flatulence than other beans; also, it is a better source of lysine (one of the nine essential amino acids) than any other legume. It is easier to digest than any other dal. Convinced? Let’s try some recipes. Another dal that is native to India, but from the east coast and the south. From there it has been taken to Africa. As a crop, it is drought-tolerant, good as a cover crop, and good for farm animals to graze on; so it has been used for purposes other than eating. In fact its ability to grow in low-rainfall has made it a tantalizing prospect for promoting nutrition in the more arid (and protein-deficient) regions of Africa, and that research led to tuar dal’s genome being completely sequenced, the first legume to achieve that distinction. The dried seed looks like a beige pea. Cultures that grow it have found use for its green pods and leaves; but most of India uses it in its dried, split and dehusked form. That is how I am familiar with it — as a round yellow half-sphere. It takes longer soaking and cooking; but the flavor when thoroughly softened is so unique in its earthy way that cultures across India have built classics of home-cooking around the dried pigeon pea. Gujarat’s classic sweet and sour dal is made from it, as is Tamil Nadu’s sambhar; and the sour brothy rasams from the south. Some recipes follow. In India the word ‘lentil’ is often just used to mean ‘dal’, but I have recently discovered that lentils are actually a particular type of dal. They come in different sizes and colors but all are little flying saucer shaped — hm, lenses (the species name is a clue to their shape). Masoor dal in particular, is one of the larger lentils, beige when full, orangeish-pink when split, which then turns yellow when cooked. 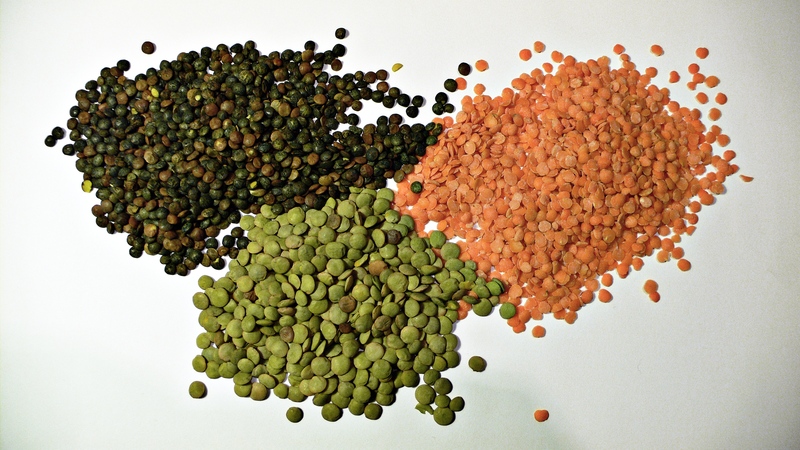 There are also green lentils; black small ones called beluga lentils; gorgeously speckled French lentils; but all are the same species, Lens culinaris. By eating lentils one is peeking into the beginnings of civilization. This was one of the first plants to be domesticated around the near east in the area known as the fertile crescent. A wild form of lentil still grows around there. No wonder one finds the use of lentils in cultures all around, including Europe and the middle east; but this is usually the whole seed. As far as I know, masoor dal is the only one where the split, dehusked form is used. Masoor dal cooks quite quickly and does not need soaking. It’s flavor is very subtle, and in my opinion, benefits from some added aromatics. As in the recipe that follows. Something called ‘channa’ appears in so many forms that it has always confused me. Let me attempt to sort out my own confusion here, and possibly be of use to others too. Cicer arientenum is the chickpea. It was also first cultivated around the middle east, where wild forms still grow. It has links to the Romans; the name ‘cicer’ was suggested by Pliny, the Roman naturalist. Thousands of years of cultivation led to the chickpea becoming large, light beige in color, into the familiar garbanzo bean, or kabuli channa, that we are used to (Indians were introduced to this bean via Afghanistan, hence the name ‘kabuli’). But before this domestication proceeded, the original smaller and darker form seems to have traveled to India. This is grown extensively in India and Pakistan and known as ‘desi channa’ or ‘kala (black) channa’. This form has a higher fiber content and lower glycemic index than the bigger form. While it is still green, this channa can be boiled and eaten with chaat spices as a salad. When fully dried and dark brown, it can be roasted slowly until the outer husk just falls off; this roasted channa is sold all over Indian streets in newspaper cones for a pittance. It can also be dehusked and split, to become the familiar channa dal. Or ground up to become the familiar besan (chickpea flour). This of course is used in India in a hundred ways from batters to egg-less omelettes to kadhis. But it was a revelation to me to learn that besan is also used in Italy, cooked in the same way as polenta. Here is a recipe for that. Recipes for channa dal used as a dal follow. ‘Dal’ is not synonymous with ‘legume’. The latter is a plant family, while the former says something about the preparation as well — dal is usually cooked to mush. For instance, tamarind is a legume too, but no one would call it a dal. It doesn’t translate to ‘lentil’ which is one type of dal (for example, masoor). It doesn’t translate to ‘bean’ which seems to be more about the shape — for instance, a coffee bean is called a bean but is certainly not a dal. The word bean also seems to exclude the dehusked and split version of dals. ‘Pulses’ is usually used for the crops, and, as far as I know that word is only used in India. I have somehow never caught on to masoor dal. 😦 I was chary about eating Udad in any form but idli but overcame that when I had the assorted dals that use it. But am still to convert to masoor. Now you have be thinking about the apt word for ‘dal’…. Tamarind is a legume but not a dal. Says it all. Aruna if you think about a word let me know. ‘Dal’ seems to be a concept so unique to India that perhaps that’s why the word is unique too. What great information, in so many ways. Am really going to study this. Thank you Aneela. As I find time I plan to add to this…. PS I really like the agricultural info and seeing the food as a plant. Yes exactly! We were so used to buying these dals in 5lb bags that it was a revelation to explore a little of where they come from. Yum…sounds great. Hope you were able to have some!